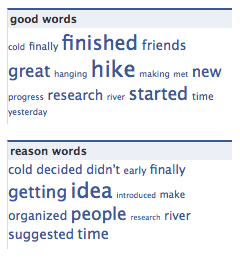 Tags: design, research, social software, three good things, word clouds. Follow any responses to this post with its comments RSS feed. This is a very interesting project! I especially like how therapeutic the project’s goal is. (1) On the surface, it might just be that you need a better filtering mechanisms for the words. Along with what you’ve suggested above, what about just keeping the nouns and the verbs? (2) A second reason could be that extracting words out of what are essentially narratives — to help your users find the similarities between them — doesn’t really work because the the words don’t evoke the narratives themselves. What if you extract the most frequently occurring words out but surround them by their context (say the sentence in which they occur)? I am thinking this will function better as a way to make your users think back over their experiences. Hi – thanks for the thoughts. (1) I think that filtering is worth exploring. Possibly at as coarse of a level as nouns and verbs, possibly trying to be more precise.